DeviceNet slave module with baudrate up to 500kbit. All registers of the MAC motor can be read and written. Device type is "position controller” which is standard method for controlling position on Devicenet. EDS files, functions block and program examples fully documented for Omron CJ1, Allen Bradley SLC500 and Logix and available for download. The module has M12 connectors for use in harsh environments and BUS IN and BUS OUT for easy implementation of bus systems. M12 connector module has 4I/O eg 3 inputs and 1 outputs. 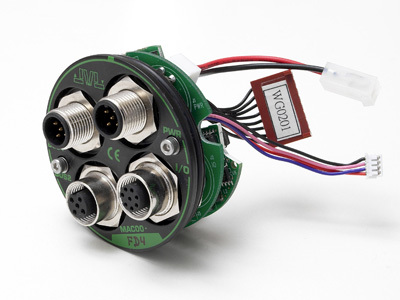 On special request the module is available with cable glands with 6 inputs and 2 outputs.